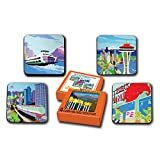 A set of 4 cork-backed coasters featuring 4 images from the upcoming book S is for Seattle. Michael Schafbuch is the illustrator of A is for Aspen, B is for Boston, C is for Chicago and the upcoming T is for Texas. He is also a celebrated fine artist in his hometown of Seattle, WA.